Find this book at Amazon.com | buch7.de | eurobuch.com | buchhandel.de | books.google.com ASIN=0415040248, Category: Philosophy, Language: E, cover: PB, pages: 528, year: 1990. 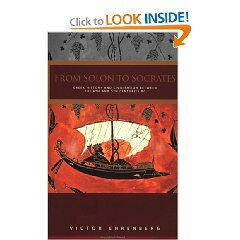 The dual purpose of this book is to describe the greatest period of Greek history in all its aspects, political and military as well as economic and cultural, and to take into account the uncertainties of modern scholarship. "if life was a good one, you'll only know at the end." "if life was a good one, you'll only know 5 minutes before the end." The risk that something bad could happen during the remaining few minutes is quite small. Nevertheless, I wasn't quite satisfied with this interpretation, because I thought about a physics Nobelprize winner's famous last words (which had been tape-recorded) "I'd hate to die twice!" I don't judge this person, but if I would have similar feelings at the end of my life, I'd consider the chance I got with my earthly existence as totally wasted - and would be obliged to admit that my life was not good - even if that happened only at the last moment.
" Who said that? That's good! - and it's right; you can't know it earlier." "no man's life should be accounted a happy one until it is over." "Count no man happy until he be dead." continued happiness unto the end we call happy...."
Croesus had considered himself to be the happiest man alive and Solon had advised him, "Count no man happy until he be dead," because at any minute, fortune might turn on even the happiest man and make his life miserable. It was not till after his kingdom had been taken from him by Cyrus, the Persian, while he lugubriously waited to be incinerated on a pyre, that Croesus acknowledged the wisdom of Solon's advice. -- quote "Herodotus' Histories I." "if life was good, you'll only know at the end." Ja, zwischen der Frage danach, ob unser Leben "gut" und ob unser Leben "glücklich" war, ist ein starker Unterschied. Yes, there is a strong difference between the question, if our life was "good" and if our life was "happy". Oui, la question de savoir si notre vie a été "bonne" et la question de savoir si elle a été "heureuse" sont fort différentes. Croesus schätzte sich auf Grund seines Reichtums glücklich, aber unsere Alten (Griechen und Römer) wussten, dass das Glück nicht konstant ist. Cresus believed to be happy due to his wealth, but the old (greec and romans) knew that fortune is not constant. Crésus s'estimait heureux à cause de ses richesses, mais les Anciens savaient que la fortune est inconstante. Das ist, was wir auch heute noch sehen. This is what we still see today. C'est ce que nous voyons encore aujourd'hui! Wer kann wissen, ob sein Leben gut war? Who can know if his life was "good"? Qui peut savoir si sa vie a été "bonne"? Wer kann die Güte eines Lebens beurteilen? Who can judge the goodness of a life? Qui peut juger de la bonté d'une vie? Wir müssten wirklich die Absichten des Herzens und die objektiven Auswirkungen unserer Handlungen kennen. We would need to really know the intentions of our heart and the objective consequence of our actions. Il faudrait que nous connaissions vraiment les intentions du coeur et les effets objectifs de nos actes. Aber das entkommt uns zu einem grossen Teil, wenn nicht ganz. But this evades us in part, if not fully. Or cela nous échappe en grande partie sinon en totalité. Das ist der Grund, dass ich während unseres Gespräches sagte, dass allein* Gott das wissen kann, weil er der einzige ist, der nach einer vollen und wahrhaften Gerechtigkeit urteilen kann. This is the reason, why I said during our discussion, that only* God can know it, because he's the only, who can judge according to a full and truthful justness. C'est pourquoi j'avais répondu, lors de notre conversation que seul* Dieu peut savoir, parce qu'Il est le seul à pouvoir juger selon une pleine et véridique justice. Jesus hat gelehrt, dass Gott gut ist. Jesus tought, that God is good. Jésus enseigne que seul Dieu est bon. Und insoweit als wir an seiner Güte teilhaben, können wir selbst gut sein. And as far as we participate in his goodness, we can be good ourselves. Et c'est dans la mesure où nous participons de sa bonté que nous-mêmes pouvons être bons. Eines der Kriterien der Güte ist ihre Universalität. One of the criteria of goodness is its universality. Un des critères de la bonté, c'est son universalité. Wenn eine Sache gut ist fuer irgendeinen, muss sie für alle gut sein. If a thing is good for someone, it should be good for all. Si une chose est bonne pour quelqu'un, elle doit être bonne pour tous. Zum Beispiel, es ist sicher gut sich persönlich weiterzubilden, weil diese Bildung früher oder später auch anderen zugute kommt. For example, it is certainly good to educate oneself because others will profit from this instruction sooner or later. Par exemple, il est certainement bon de s'instruire personnellement, car, cette instruction profitera tôt ou tard à d'autres. andererseits können wir auch eine bestimmte Güte in der Krankheit sehen, in der Hinsicht, dass sie uns Demut lehrt. however we can also see a certain goodness in the illness as far as it teaches us humility. cependant on peut aussi voir une certaine bonté dans la maladie, dans la mesure où elle nous apprend l'humilité. Das Urteil wird schwierig, weil wir nicht wirklich alle Effekte aller underer Handlungen sehen. The judgement becomes difficult, because we don't really know all consequences of our actions. Le discernement devient difficile, car nous ne voyons pas vraiment les effets de tous nos actes. Auch glaube ich, genau wie unsere Alten, dass man das Ende des Lebens abwarten muss, damit die Bilanz des Lebens gemäss des Lichtes der göttlichen Gerechtigkeit erstellt werden kann. Also, like the Old, I believe, that we have to wait for the end of life so that the balance of life can be established in accordance with the light of the divine Justice. Aussi, je crois comme les Anciens, qu'il faut attendre la fin de la vie, pour que le bilan puisse être établi, selon la lumière de la Justice divine. *) Seul etait souligne parce que c'est Dieu seul que Jésus appelle "bon" ; ce point éclaire la question du bien que nous ne pouvons connaître que par analogie. Immanuel Kant wrote, we can't actually achieve happy life, we can only strive to make it "glückswürdig" (in German), i.e. worthy of happiness.